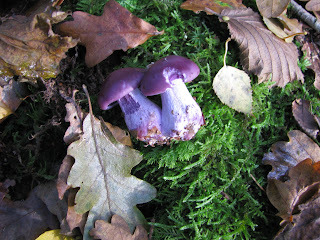 These lovely mushrooms are called wood blewitts (Clitocybe nuda) or blue stalk mushrooms. Blewitt is the old English word for 'blue' and they do have a distinctive blue tinge to them. There are found in both deciduous and coniferous woodland and are widely eaten, though some caution should be exercised as there are known to cause an allergic reaction in some individuals. 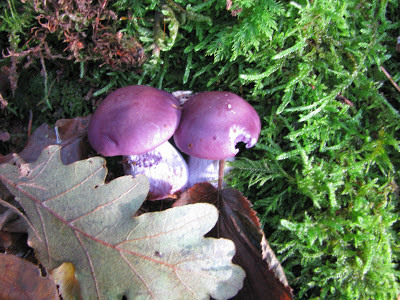 They are quite a common mushroom and have a distinctive purple cap and stem. Care is needed to make sure that these edible mushrooms are not confused with the poisonous, larger purple species of Cortinarius fungi so please make sure you only pick them if you are with a mushroom expert. Often growing in fairy rings, the cap can grow up to 15cms and have a mild aniseed smell. They are a popular food amongst wild food fans who like to cook them in butter with leeks or onions and you can find recipes, more pictures and lots of useful information on the wildmushroomsonline website here. Of course there are lots of different types of fungi that grow in the British Isles. We'd love to see your photos or hear your stories so get in touch with me at juliedoherty@avonwildlifetrust.org.uk and let me know what you find.